Before you start writing your essays, before you can start sending away your SAT and ACT scores, and before you can head off on college visits, you have one big task to complete: compiling a balanced college list. If you already have a handful of schools you like, this might seem like a no-brainer. However, creating a smart, balanced college list is actually a bit of an art form. College Major Choice – Don’t forget that you’re going to college primarily to learn! Make sure that the schools you’re looking at have solid programs in the field you’d like to study. (Not every school has a Business major or a Fashion Merchandising major.) Check out the professors and alumni of that particular program. What are their credentials? What have alumni done with their degrees? Also, check to see what special facilities they might have on campus for students in that field. This can usually be a good indicator of how robust the program is. Location – Ideally, you’ll be spending the next four years in a place that makes you happy. College will be your new home. If you absolutely hate cold weather and the big city lifestyle, NYU might not be the place for you. Class Size – Do you learn better in a smaller setting or are you comfortable absorbing information in a lecture hall? Sitting in on a few classes during your college visits is a MUST. This is especially important at bigger schools since most high schoolers have little (if any) experiences with classes of over 40 people. Cost – Make sure that the cost of the school is within the realm of possibility. Although scholarships are typically granted more frequently from private universities, you should have an open and honest conversation about the cost. Once you’ve got a list of schools that meet the above criteria, the next thing you must do is honestly evaluate your own academic performance. You’ll have to look at your own transcript, test scores, course load, class rank, extracurricular activities, and so on through the eyes of the admissions counselors. Make an appointment with your school’s college counselor or an independent counselor to start this daunting process. They can talk candidly with you about your options, suggest schools, and help you understand how you measure up to admitted students. Then, it’s time to get down to business. As you probably know, the Internet holds the answers to just about everything. If you have a general list of schools, it’s time to check out their websites and get an idea of what kinds of students they’re admitting. Somewhere, that school will provide statistics for their most recently accepted class. (An easy way to find this info is to Google “[University Name] freshman profile”.) For each school, you’ll want to jot down things like test scores and class rank of the middle 50 percent of admitted students. Also, check out the overall acceptance rate for each school. However, be careful with schools that offer automatic admits. For example, the University of Texas shows an average acceptance rate of 40%. 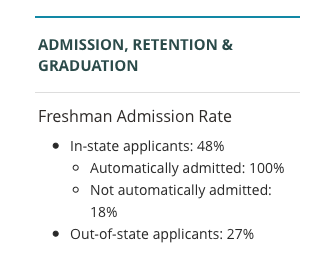 But if you dig a little deeper, you’ll see that the acceptance rate for non-automatic admits is only 18%. Also, if you are applying out of state, know that acceptance rates may be different for you. Having all of this information will show you how you measure up. A reach school is exactly what it sounds like: a school that would be a reach to get into. For these schools, your stats are not quite as good as the middle 50% of admitted students. You wouldn’t bank on getting into these schools – in fact, reach schools are schools that you have less than a 30% chance of getting into. However, these are schools that you love and would be thrilled to attend. Numbers are only part of your story, after all! You should send in stellar applications showcasing what else you have to offer to these three or four reach schools. Target schools are those schools where the middle 50% of admitted students look very similar to you. You have a higher chance of getting into your target schools than your reach schools ­– about a 30 to 60% chance of being accepted. You should send in applications to four or five of these target schools. Remember, they should all be schools you’d be happy to attend! Likely schools are (obviously) the schools you’d be very likely to get into! If your profile is stronger than the middle 50% of admitted students, the school falls in this category. You’d have a 60% chance or more of being accepted into these schools. These are also often called “safety schools.” Again, don’t apply to a bunch of likely schools simply because they all seem “in the bag.” These should still be institutions you’d love to attend! Once you’ve compiled a list of these reach, target, and likely schools, you can focus on these schools, and these schools alone! This strategic, balanced college list is your starting point. Start researching more about these schools – the more you know about each specific university, the better you can tailor your applications. Most importantly, keep your mind and your options open. It’s okay to have a dream school… I certainly did! But once you have this balanced college list, use it as a reminder that there are plenty of schools that you’d be lucky to attend, and they would certainly be lucky to have you!